Collaboration in groups can be encouraged via the group tools. Most of these tools are only accessible for group members. Some of these tools however deliver limited access to other course members, like the Group Blog (not creating new blogs, but reading and reacting on blogs) and the Group Wiki (reading wikis). Collaboration This allows group members to collaborate by using the virtual classroom and chat. File exchange Students and instructors can upload documents such as minutes, reports and pictures. Students can only see the documents of their own group. 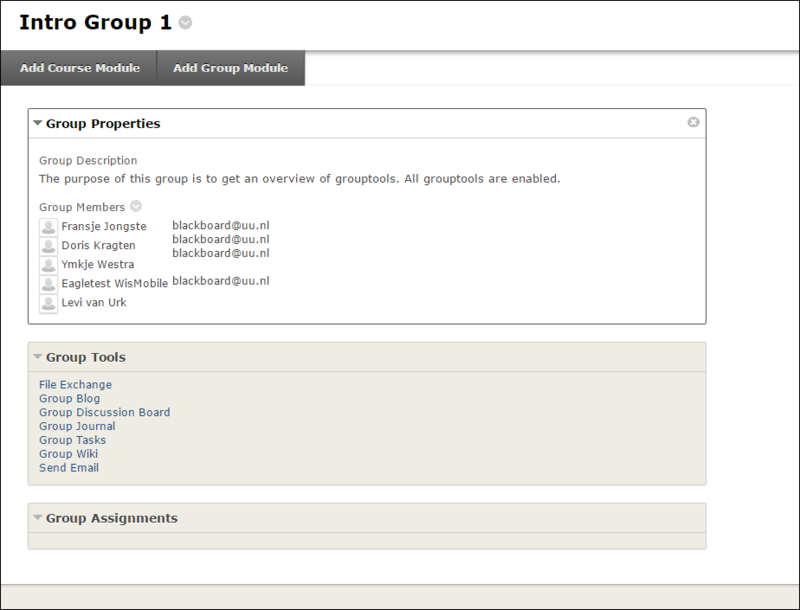 Instructors have access to all files of all groups. Group Blog Group members can make contributions to the group blog (text, video, audio) and comment on each other’s contributions. A blog can be used to keep each other informed about progress, share information, and more. All students within a course can read the group blog and comment on it, but cannot post new contributions. Group Discussionboard The discussion board can be used to hold group discussions and is only accessible to group members and instructors. The discussion board can be used to share hypotheses, arguments and counter-arguments. Group Journal A journal can be used as a log/diary for reflection (e.g., on the group process). Only group members (and the instructor) can see each other’s journal posts and add comments. The group journal can also be used to communicate with the instructor. Group Tasks This can be used to keep track of tasks (activities) and to indicate their priority and status. Group Wiki A group wiki is used for working on a shared web document. A wiki is suitable for collecting, sharing and editing information (text, picture, video, audio). 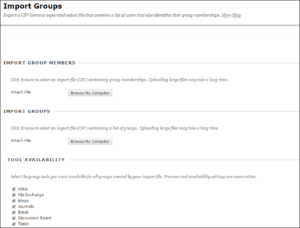 Group members can make additions and changes to a group wiki. The wiki is by default visible to all students participating in the course. Send Email Group members can send each other email messages. 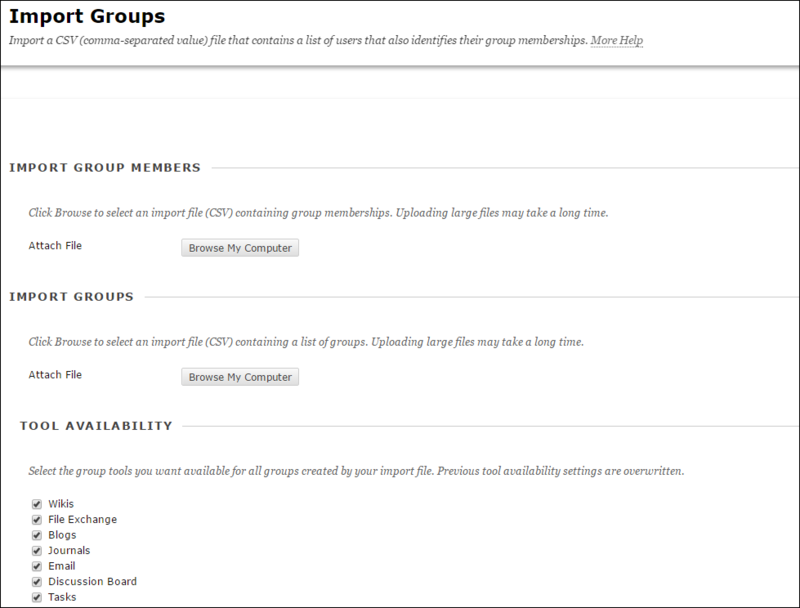 There are several ways to find out which group tools are assigned to a group, both of them reachable via ‘Users and Groups > Groups’. If you click ‘Tool Availability’ at the ‘View Options’ menu above the list of groups, the availability of tools for every group will be shown. To change the availability of a tool, you just have to click the cross/checkmark of the respective tool, it will toggle from enable to disable or vice versa. If you click at the group name, you will see the available tools and more information of this group. This page does not allow you to change the availability of the tools assigned to the group. 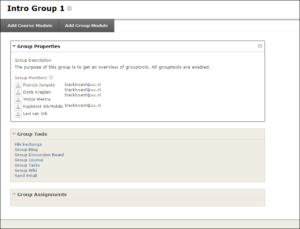 If you need, you may remove the Group Module of the Group Tools. Click the requested tools. After the import, all the groups will inherit the selected tools. If you want to add more details to the tools, you will have to edit the group, this is explained below in 2. (Wijzigen van bestaande group: klik bij de naam van de group op ‘Edit Group’). Bij het onderdeel ‘Tool Availability’ op de aanmaakpagina voor groups kunt u aangeven welke tools moeten worden meegegeven aan de group. Bij enkele tools kan worden aangegeven of grading mogelijk is, bij het discussion board kan het aanmaken van een discussieforum worden afgeschermd.